This week, the World Gold Council (WGC) confirmed something we’d already suspected: 2010 was a remarkable year for gold. Overall demand grew by 9 percent to reach a 10-year high on increased jewelry demand, strong momentum in key Asian markets and a paradigm shift in the official sector, the WGC says. Demand for jewelry was the biggest contributor to gold demand, accounting for 54 percent of the total. That’s a 17 percent rise despite gold prices jumping 26 percent in many currencies. Gold demand for technology increased 12 percent. Surprisingly, investment demand declined 2 percent as investment in gold ETFs dropped 45 percent. 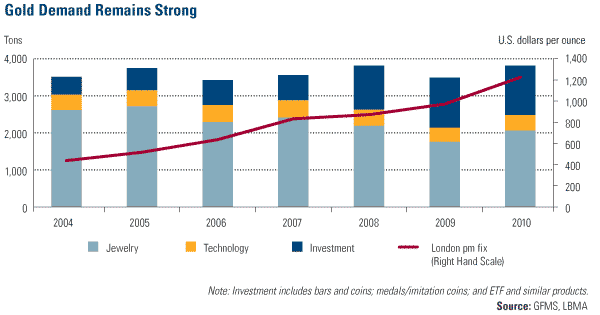 Even with the drop, 2010 was the second-highest year on record in terms of investment demand. India led the world in gold jewelry demand with more than 745 tons. 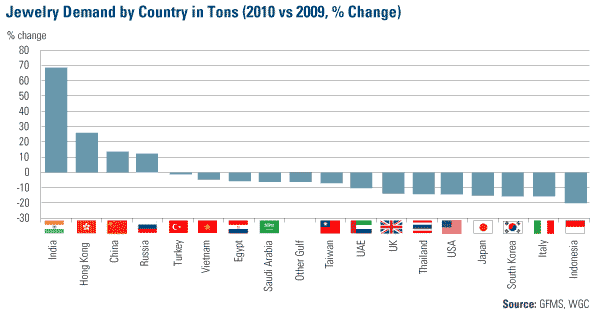 China was a distant second at just under 400 tons and the U.S. third at 128 tons. While the pace of consumption has slowed in several countries, gold consumption for jewelry remains at elevated levels around the world. The story behind the rise in demand is one you’ve heard from us before. The WGC’s data is validation that the love trade is firing on all cylinders. Ignited by the Diwali Festival of Lights, Indian jewelry demand rose 47 percent on a year-over-year basis during the fourth quarter of 2010. For the year, Indian jewelry demand rose 69 percent to surpass peak levels set back in 1998. In Hong Kong, gold jewelry demand rose 26 percent to hit a 10-year high, according to the WGC. In China, buyers didn’t shy away from record-high gold prices either. Purchases of gold jewelry accelerated 25 percent during the fourth quarter leading into the Chinese New Year. The love trade is significant and unique to gold. People buy gold out of love and those in emerging markets are especially amorous of the metal. In fact, the four strongest markets for gold jewelry demand (India, Hong Kong, China and Russia) accounted for 60 percent of the entire jewelry market in 2010. The rise in Chinese gold demand goes hand-in-hand with a rise in average incomes for Chinese citizens. Last year, 20 million migrant workers in China saw their incomes rise 24 percent. Compare this to the U.S. where the job market has shown some signs of life, but continues to sputter. With these higher income levels, many in China’s middle class are looking to gold as a means for long-term savings and a possible hedge against inflation. 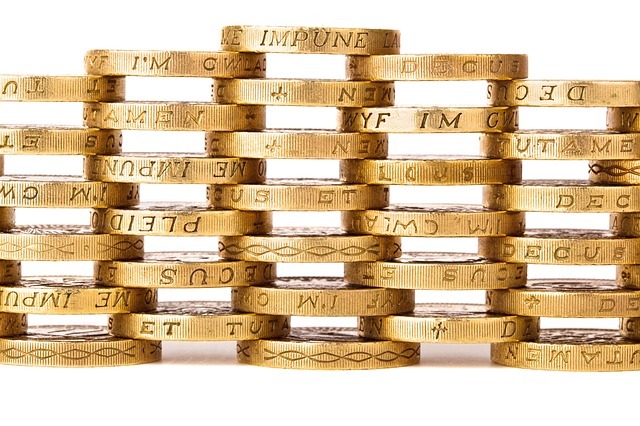 The success of the WGC’s gold accumulation plan is an example. It allows Chinese consumers to purchase small amounts of gold on a routine basis to build a portfolio. With more than 1 million participants, the program has been so successful in its first year that the WGC and its domestic partner, ICBC, is launching a new program to encourage the gifting of gold bars. Gold bars as small as 10 grams can be stamped with the Chinese symbol for joy and given to another. What’s important to remember is that this trend is just getting started. You can see from this chart that China consumed roughly one-quarter of a gram per person in 2009. 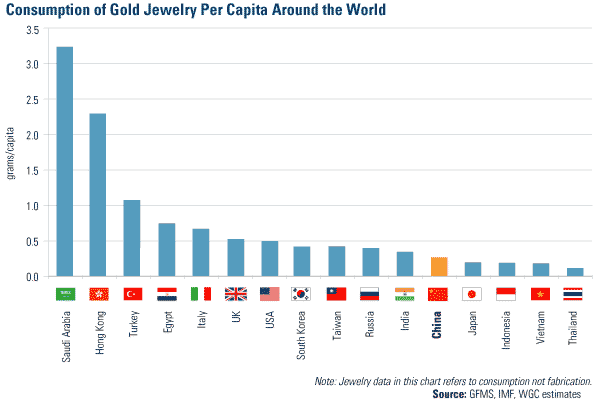 This is significantly less than Hong Kong and Saudi Arabia, which are the most avid consumers, and lower than other Asian countries with cultural affinity for gold. Gold will be interesting to watch as a barometer of good and bad government policies. In countries such as China, where the embrace of free market principles has ushered in economic growth, gold demand levels should remain strong. This is what makes today’s gold market different from the 1970s. Back then, today’s emerging market powerhouses, such as China and India, had no global economic impact. Now, these countries aren’t just at the forefront of the gold market, they are global leaders in economic growth. It is by no coincidence that 30 years after Deng Xiaoping took office in China and began instilling the concepts of free markets, the country has grown to become the world’s second-largest economy behind the U.S. If countries like China and India continue to grow by 7 to 9 percent a year, the corresponding rise in incomes should keep the fire of the love trade burning. In this scenario, gold can continue to slowly appreciate.